Click here to share or send a greeting with this image. Touring Egypt 4: Here is the promised repeat from an earlier post. Since the previous post today was so lame, I promised these, which are among my favorites from Egypt. For the record, this was originally posted on 5 August. But I think these belong in the “Touring Egypt” series, too…. This is probably my favorite image from Egypt. I love Egypt. The people are friendly (at least, those who deal with tourists are), the food is wonderful, and the setting can’t help but be exotic to someone who grew up in America. As a history addict, I love to wander the sights and realize that this place was civilized before most of my home culture was even fully established. [Note: I said “culture,” not “country.” Here I refer not to America, but to what came before.] Being in this place, seeing these sights, touching these stones, I can’t resist trying to imagine what life must have been like … then. I am sure this site will soon have more photos from Egypt but for now, these are my favorites. I was traveling with family and we were passing through Luxor for one day only. We arranged with a tour guide to be met at Luxor and given a quick whirlwind tour. This was not my first visit, so I knew there is so much in and around Luxor that there is no way one could see it all in a day. It would be worth a couple weeks; there is no way it can be done in a day. 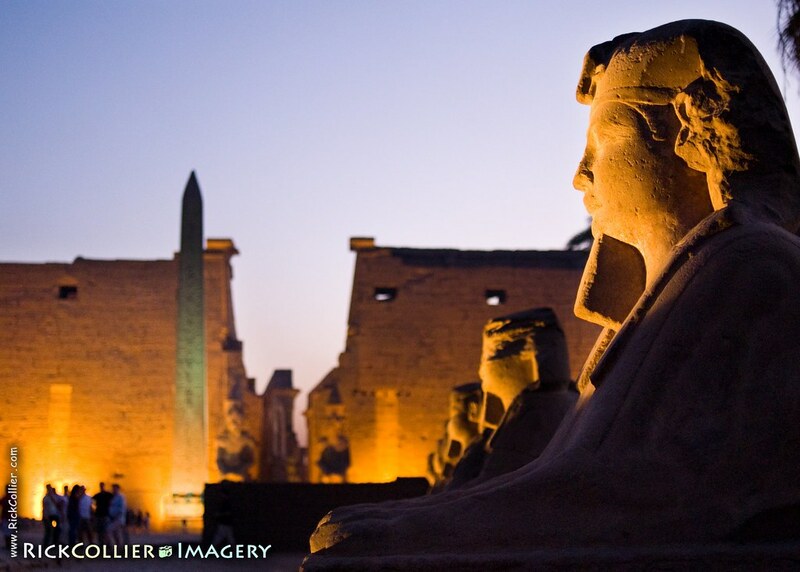 Luxor was the center of the ancient Egyptian spiritual world for centuries, so the place is literally full of temples, monuments, tombs, and other ancient ruins: The Valley of the Kings, Luxor Temple, Karnak Temple, the Temple of Hatshepsut, the Colossi of Memnon … and hundreds more. Some of my party had never been to Egypt before, so we arranged a tour to see as much as we could and hoped for the best. Little did we know our guide would actually arrange flying visits to all of the sites mentioned above (each of which on its own is worth a half day at least). It was a long day. And hot. Very hot. Lesson learned: When in Egypt, if the customer expresses a preference the guide might not argue. They will likely do their very best to do as asked. It was a VERY long day. We ended the day at Luxor Temple. We were half dead by then, but this would be the last stop. This place stays open later than the other monuments and attractions in the area, beautifully illuminated with floodlights for a couple hours after sunset. We arrived as the sun was setting. We dragged ourselves wearily into the temple grounds and walked to the main temple entrance on the end of the sphinx-lined ancient road that the ancient Egyptians built to connect Karnak and Luxor temples. I turned and saw the rich colors of a sky darkening to deep purple-blue as the floodlights threw the ancient world into amber high-relief. I recognized the scene immediately: I’ve admired it hundreds of times on travel posters. It’s another shot I always wanted to take. Standing there, I suddenly knew how they got that shot. For once the shot did not come from someplace where tourists could not go or at a time when tourists could not be there. The trick to this one was just to know what the light would do and to be there when it happened. I didn’t have long in the fading light and unlike the pros who shoot the travel posters, I had to work around the other tourists. Suddenly, I had energy. I switched to my fastest lens and fired away. This entry was posted on Thursday, August 27th, 2009 at 16:46 PM. 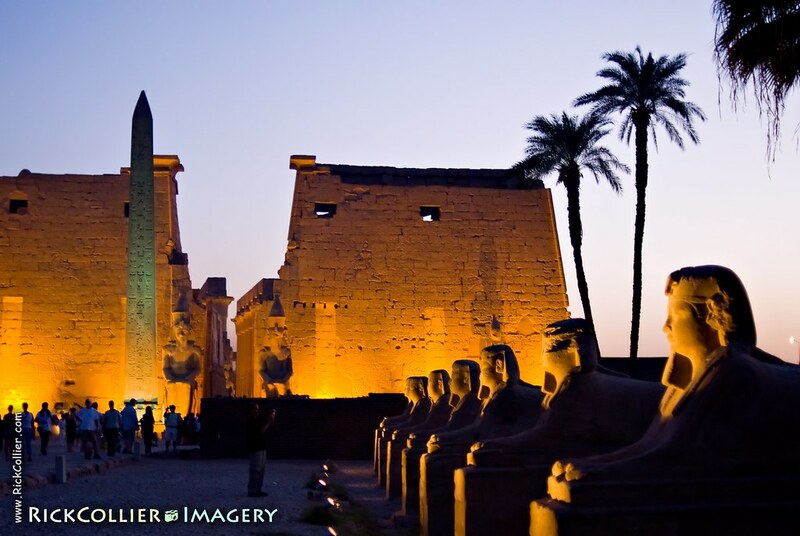 It is filed under Land & Air, thePhotoTourist and tagged with Ancient Egypt, destination, Egypt, lights, Luxor, Luxor Temple, night, not_uw, obelisk, sphinx, sunset, surface. You can follow any responses to this entry through the RSS 2.0 feed.